... not realizing that FF writer/artist John Byrne and editor Mike Carlin were working on #293, which literally removed Central City off the map and sent it several thousand years into the future. They eventually hit on the idea that the FF's rocket could have crash-landed in a different city from where it was launched. 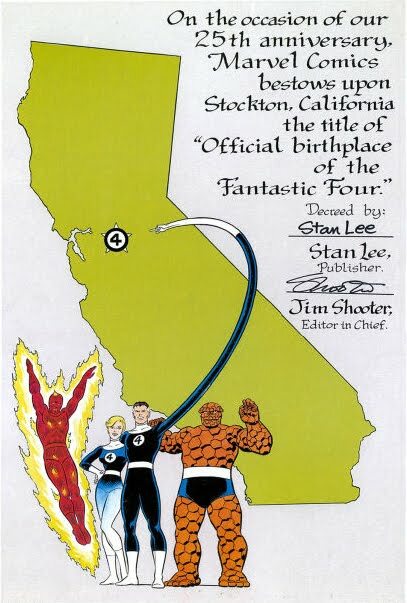 So it was decided that it could crash in Stockton, thus securing that city as "birthplace of the Fantastic Four" without actually contradicting existing continuity where Central City had been named. There was a fair amount of media hype at the time. Field told me recently, "I was told that Mike Carlin was not a happy camper about having to try to shoe-horn my campaign into continuity. It wasn't until several years later when I met him in person in San Diego after he had moved to DC, that I went up to him, introduced myself and apologized for getting in the way of his job. Mike is a great guy and waved off the whole thing saying we had given that title more publicity than they could have generated on their own." 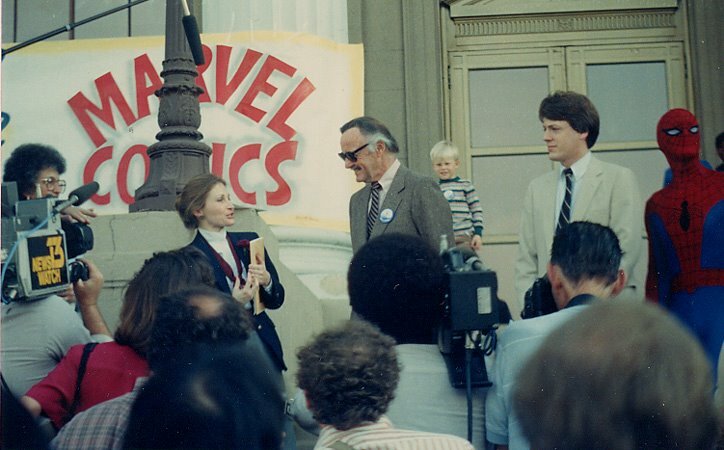 Lee in fact visited Stockton in February 1986 as part of a formal celebration in front of City Hall. He was given a key to the city and there was the semi-obligatory signing. Not long after, Lee hired Field on as his and his wife Joan's public relations man, so impressed he'd been with the work Field had done on the Stockton campaign. The last part of the campaign involved printing up and selling 1,000 limited edition commemorative prints honoring the event. The money raised went to flood relief in Northern California. I still have mine (#278) hanging framed near my comics collection. Field says he's got other new clips from that whole period that he'll be posting on YouTube as he's able, but that is what the whole thing was about. Keep your eyes out for more footage! Coolo. I remember the crash site being identified in #296, but had no idea about any of this. Thank you for this post! I discovered your blog today when searching for info about Stockton and Central City. So many sources claim that Marvel simply replaced Central City with Stockton, which really confused me this week when re-reading Fantastic Four #295 (in which Central City is wiped off the map) and then the very next issue, #296, in which the Thing visits Stockton. This Stan Lee quote from 1986 certainly doesn't help: "We've coped with the destruction of universes. We can handle this... The least we could do is give a break to a decent, respectable city like Stockton. We're not going to destroy Central City. We're going to rename it." "But earlier this week, Marvel Comics officials said it was practically too late to change the plot of the upcoming 25th anniversary issue, in which the heroes' hometown is wiped off the face of the Earth. Then they came up with an inspired idea. According to the revised story line, the Fantastic Four still hail from Central City. But when they took off on the rocket that launched them into outer space -- where they were stuck by the radiation waves that transformed them into superheroes -- it was from nearby Stockton." In other words, they lived in Central City, but launched from Stockton. Sadly, neither version of the truth explains how, if Central City disappeared in Fantastic Four #295 (published in 1986), there is still a Central City International Airport in the 1999 Machine Man series "X-51" #1. Apologies for thinking too hard about Marvel continuity, and thanks again for the info!